As Canadians spend more time outside during the warmer months, it's important to recognize that taking precautions to protect your health when outdoors involves more than just remembering the sunscreen. Tick-borne diseases are the result of an infection by disease-causing agents such as viruses, parasites and bacteria that can be contracted through the bite of an infected tick. In Manitoba, there are several species of ticks but only one species, Ixodes scapularis, is responsible for spreading tick-borne diseases to humans. 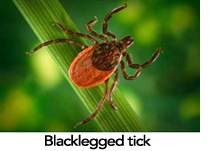 This tick is more commonly known as the deer tick or the blacklegged tick. Other tick species, such as the more common wood tick, are not effective vectors of disease causing agents in Manitoba. There are three reportable tick-borne diseases found in Manitoba: Anaplasmosis, Babesiosis and Lyme Disease. Anyone who feels that they may have contracted a tick-borne disease should see a doctor. Tick-borne diseases can be successfully treated and treatment is most successful in the early stages of infection. In addition to the three reportable tick-borne diseases, Manitoba Health, Seniors and Active Living (MHSAL) also monitors tick populations for the introduction of other disease causing agents such as Borrelia miyamotoi and Powassan virus. In 2015 Anaplasmosis became a provincially reportable disease in Manitoba. * At present Anaplasmosis is not reportable nationally and surveillance case definitions reflect those developed by MHSAL. ** Some reported cases are currently under investigation; these cases will be classified when the investigations are complete. In 2015, Babesiosis became a provincially reportable disease in Manitoba. * At present Babesiosis is not reportable nationally and surveillance case definitions reflect those developed by MHSAL. In 2009, Lyme disease became nationally reportable. National definitions for confirmed and probable cases were developed by the Public Health Agency of Canada (PHAC), whereby Canadian jurisdictions will consistently report both confirmed and probable cases. ** Cases listed as “Other” include those that have been reported to MHSAL either by a physician or lab report, but do not meet the national surveillance case definitions for a confirmed or probable case of Lyme disease. *** Some reported cases are currently under investigation; these cases will be classified when the investigations are complete.